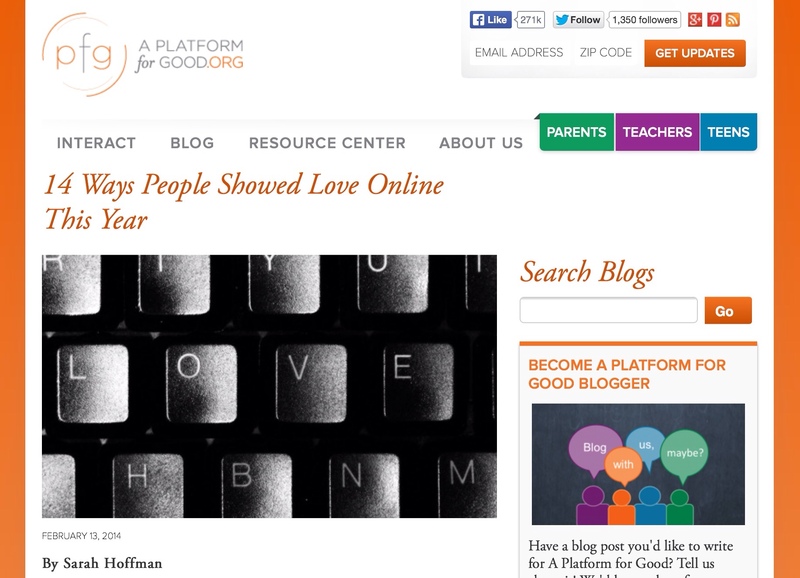 So it was quite refreshing to find a post called “14 Ways People Showed Love Online This Year” (but, then again, what would you expect from a blog called A Platform For Good?!). Besides, it's Valentines Day, and it's nice to remember that love isn't reserved for our partners and our families, but is also represented by how we show care for others. So take a few minutes to explore this article. How might we shift focus in the public from kids being bad (especially with technology), to how they can also be very, very good? How do these examples give us ideas for our own classrooms? How can we engage students in academic content, while they get to contribute to something they find to be of social significance? How else might we leverage technology to show love and care for others? This entry was posted in Engaging Tasks, Food For Thought, Learning By Doing, Motivation, Project-Based Learning, Technology for Learning, Uncategorized and tagged Kids Doing Good on February 14, 2014 by Mike Muir. I’m not sure one is better than another. I think each “version” shares a common set of characteristics and the recipe you use to mix those characteristics defines the version. And I believe that each version (that includes a quality implementation of these characteristics) brings value to different goals, needs, and contexts. What “versions” of PBL do you use and what do you like about them? This entry was posted in Motivation, Project-Based Learning and tagged PBL, Project-Based Learning on January 27, 2012 by Mike Muir. Recently, I reflected on Apple’s education announcement about textbooks and my opinion of textbooks in general and how they are often used in schools. Although I’m a fan of teachers who use textbooks as one educational resource, my concern is that in far too many places the textbook IS the curriculum, and that textbooks are inadequate at and insufficient for helping students create meaning from knowledge. Despite my concerns about how textbooks are sometimes (mis)used, I stated that I saw tremendous potential in Apple’s announcement of the iBooks Author Mac app and the iTunes U iPad app. One of those areas of potential is as a product creation tool for students. Now, students and teachers have one more tool for project-based learning. Students have another choice at their disposal when they stop to think about what kind of product would they like to create to show others what they have learned and give them a chance to learn it too! Imagine a class where the teacher breaks down the class into teams, each team taking responsibility for one chapter of their book (animals in an ecosystem; countries in the European Union; time periods in your state’s history, themes in a novel, etc.). And within those teams, not only would they be responsible for researching the topic of their chapter, but for deciding what was important for others to know about it, and thinking about how they could best help others learn about each aspect (text, videos, interviews, demonstrations, interactive models, illustrations). Of course, all this under the coaching of their teacher. Eventually, the students and teacher would compile all the components in an audience-friendly format, publish, and share. It could even be published to the iBookstore for others to buy. Students don’t only get a chance to use knowledge, but they would have a real audience for their product. What might that do to the level of student engagement? How might you use iBooks Author with your students? This entry was posted in Motivation, Project-Based Learning and tagged Good Teaching, Meaningful Engaged Learning, Motivating Underachievers, PBL, Textbooks on January 26, 2012 by Mike Muir.